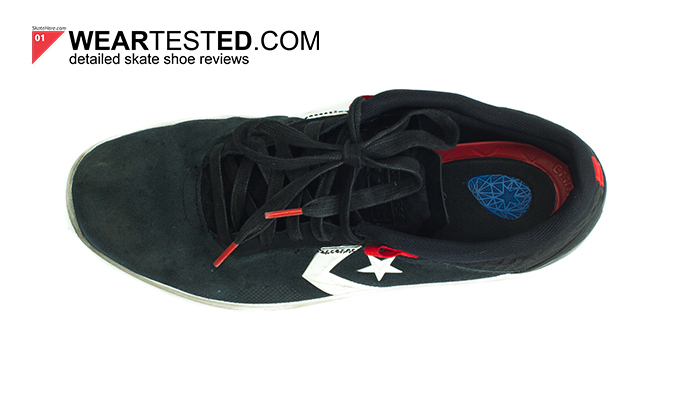 Weartested: Converse Cons Metric CLS « .::Skatehere.Com::..滑板中文第一站.. Although Nike had acquired Converse more than ten years ago, we seldom come across a Cons model that features the innovative technology a Nike Sport Research Lab would foster. Occasionally, we see Lunarlon insoles being adapted, and the quality of suede is heightened, but a new model that features technical elements in every aspect of the shoe from toe to heel like the Cons Metric CLS hasn’t surfaced until now. Jake Johnson is backing the shoe, so you know that this technnology undoubtedly covers your technical ledge skater, but also handles the high impact no complies and switch wallrides you see in his Static parts. CLS stands for Comfort, Lightweight and Stability, and the Metric CLS is the first model in Cons’ push to introduce their new platform for technical and innovative shoes. 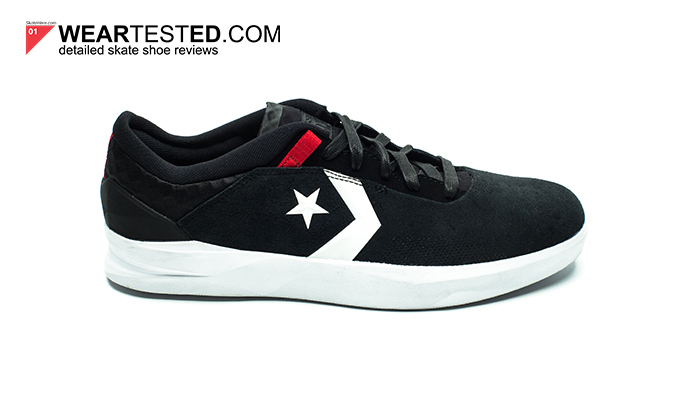 The actual silhouette of the shoe looks quite simple, but underneath it all are a bunch of added features; Cons combined simplicity and technicality perfectly to create the Metric CLS, let’s see how it skated in our 10 hr test. The Cons Metric CLS runs a half size big, would recommend going a half size down than what you usually wear. If there was one thing that was the most impressive throughout the whole weartest, it would be the durability of the Metric CLS. 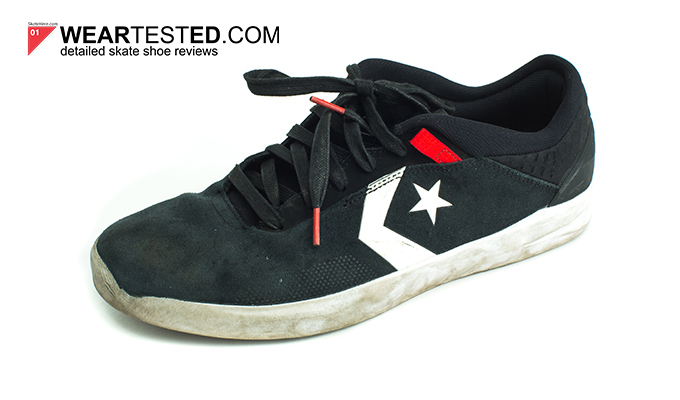 The shoe features a one piece upper made of high quality suede that showed zero holes after the test period. The whole one-piece toe cap proved to be every effective as there were no seams to be ripped in the line of fire. Moreover, after the 10 hr weartest, the outsole rubbed out before the toe-cap which was a testament to the durable quality of suede being used for this model. One impressive feature was also the durability of the shoelaces that Cons originally includes with the purchase of the shoe; the original shoelaces that are included have a bit of a wax layer that helps a bit to prevent the shoelaces from ripping too fast. In our case, the shoelaces as well as the upper not only lasted our 10-hr weartest, but definitely had enough vitality to last for another 10 hr. Cushioning is one of the three technical elements Cons is pushing in this CLS model, highlighting the advantages of a dual density construction in the midsole when it comes to absorbing medium to high impacts as well as improving the stability of a shoe. While most skate models use the EVA foam for it’s lightweight and flexibility features, Cons has adapted it’s midsole with two different density foams injected with Nike’s Phylon performance foam that have a similar composition as Nike SB’s lunarlon foam. In high impact skating when you’re jumping down 6 stairs and up, your ankles absorb the heavy impact and the awkward movements with different bails can distribute the weight unevenly to cause over-pronation, where your ankles tend to lean inwards. Con’s midsole and stable heel lock work together and almost correct your feet’s posture to prevent the over-pronation that skaters with flat feet may often face when jumping down these high impact stairs and gaps. The cushioning of this model was great, any heel bruises that would have happened were well prevented. Throughout the 10 hour weartest, the Cons Metric CLS held its shape up very well. The one piece suede toe cap held it’s structure and offered no loose seams for the toe box to lose its shape from skating. More impressive was the heel of the shoe, which was reinforced with a strong plastic shell that held up the heel’s structure extremely well, inadvertently increasing the lifespan of the shoe’s stability. Often, when your feet get sweaty from skating, the shoe absorbs moisture and the shape of the shoe changes significantly, losing much of it’s structure and stability. 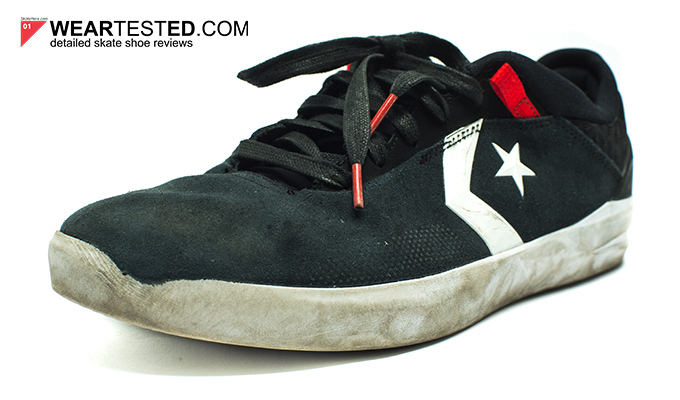 However, with this shoe, despite only average breathability, the shoe’s shape and structure was very well maintained and almost showed no signs of change over the first few sessions. The boardfeel of this shoe was only average. Although Cons stresses that their midsole construction allows a cupsole model to have a similar boardfeel as a vulcanized model, the cushioning elements still overpowered the boardfeel and felt relatively thick. Initially, grip was not as grippy as we would have thought, but gradually improved with more skating. An added feature on the shoe is a tread pattern of small dots where the kickflip and ollie hole is, which help to increase the traction of the shoe and directs a lot of the abrasion towards the traction pattern instead of the actual suede. Moreover, the outsole of the shoe features directionally shaped edges that gives the outsole more traction; different tricks require different parts of abrasion on the outsole, the edges prolong the lifespan and efficiency of the outsole’s grip and traction. Essentially, grip got better as the shoe broke in, but right out of the box the grip is only average. The grip of the sole however, was very nice and had zero blow out spots. 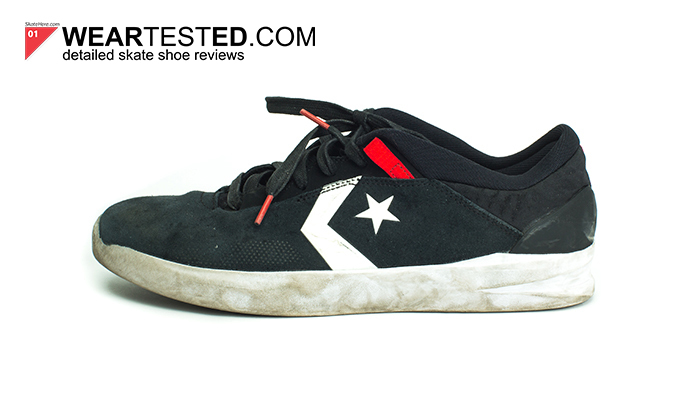 Comfort was a drawback in terms of the shoe’s overall construction. Right out of the box, the shoe feels extremely stiff, and not very flexible. With time, this improves and after our 10 hour weartest, the shoe felt like it was finally broken into. Breathability was also only average, but thankfully, the Metric CLS’ tongue was slimmed down to a very breathable mesh panel and offered heat and moisture to escape through this panel. Another feature of the tongue that added to the comfort and stability of the shoe was its tongue centering straps that eventually molded into a sock-like fabric which helped hold the shoe and the tongue in place while skating. The toecap however, trapped a lot of heat but the structure of the toe-cap was not affected. Overall, the shoe was also quite light, which was very impressive given the amount of reinforcement used on the heel and the dual density cushioning midsole. Stability of the shoe was great. As aforementioned, the shoe’s reinforced heel provided amazing structure and the inside heel lock was outfitted with some padding to hold your heel in place. 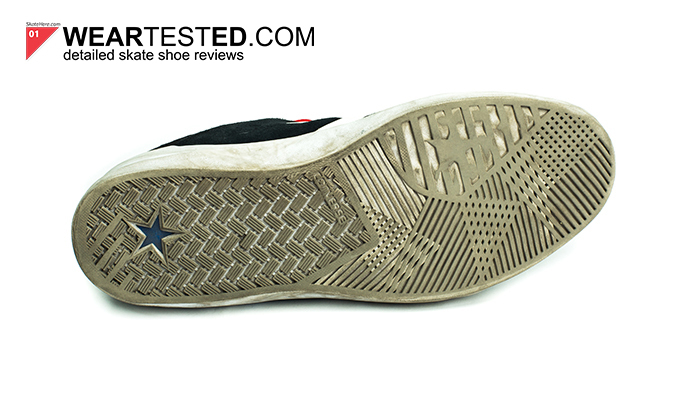 Moreover, it was impossible to take the midsole out of the shoe, so there was no worry for slippage. This, combined with the tongue centering straps allowed a very secure and stable feeling when skating with the Metric CLS. The first model to come out of the CLS technical platform is an exciting new technical shoe to be added in Cons’ product line. 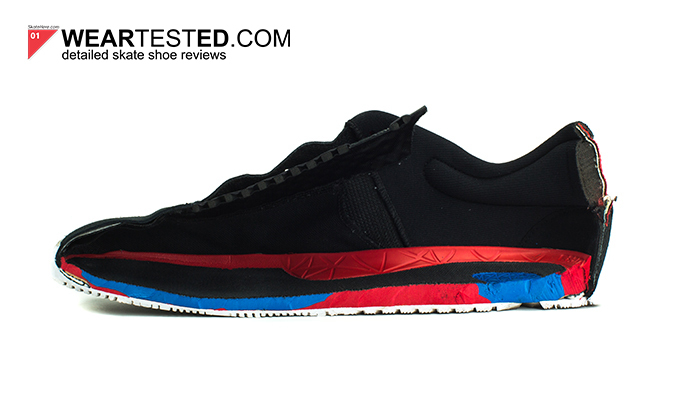 The shoe impresses with it’s prolonged durability, exceptional stability and overall dual density cushioning. But with that said, the model sacrifices a bit of comfort and boardfeel.